These commercial ultra low glare patio heaters from Chillchaser are affordable and stylish. They come with an ingress protection rating of IPX5 and will heat an area of up to 9sqm – ideal for smaller outdoor or indoor areas. The Chillchaser range of patio heaters aren’t cheap, but you’re paying for a UK based brand that offers a high-end patio heater that comes with a 2-year warranty. All prices listed are inc VAT. The Shadow 1.5kW heater is small but packs a punch. Providing heat to an area of up to 9sqm. 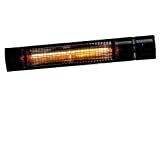 This is a perfect heater for smaller pubs, hotels, restaurants or smoking areas. Thanks to the special reflector and advanced parabolic system, this heater provides excellent efficiency at a lower consumption rate than other heaters on the market. Each Shadow heater is supplied with a SunKare Ultra Low Glare lamp – these have an average life expectancy of between 5,000-7,000 hours. There are no adjustable power settings on the Shadow 1.5kW heater. The Shadow series also comes with an extra long power cord measuring 4.5m long. If you’re looking for a futuristic and aesthetically pleasing patio heater, then the Shadow series has you covered. You’re paying a fair amount of money for these heaters and it really shows! These heaters are supplied with an “L” bracket and chains for wall mounting. Solid rating X – not rated for protection from solids. Liquid rating 5 – suitable for outdoor use during poor weather. Protected from low powered water jets from all directions. These heaters are targeted towards the commercial sector. With no adjustable heat settings or features, they are stylish set and forget providers of outdoor heat. Based on a purchase price of £234.49 (check latest price) these patio heaters will cost you just £0.03 per hour before electricity. This drops to under a penny (£0.009) once you’ve replaced the element with an ultra low glare bulb, or half a penny if you choose a standard low glare element. (Based on an estimate lifespan of 7,000-hours). To get our actual running costs we need to do a few calculations. Based on the average of 14.7p per kWh in the U.K. Assuming we were to use this heater for 9 hours per day (9am-5pm / 6pm-3am). These heaters are one of the more affordable on the market. With most commercial heaters costing between £70-110 per month in electricity. These commercial ultra low glare patio heaters from Chillchaser are affordable and stylish. They come with an ingress protection rating of IPX5 and will heat an area of up to 9sqm - ideal for smaller outdoor or indoor areas. These heaters are built to last. The upfront cost is on par with other commercial grade patio heaters, but the on-going costs are minimal! 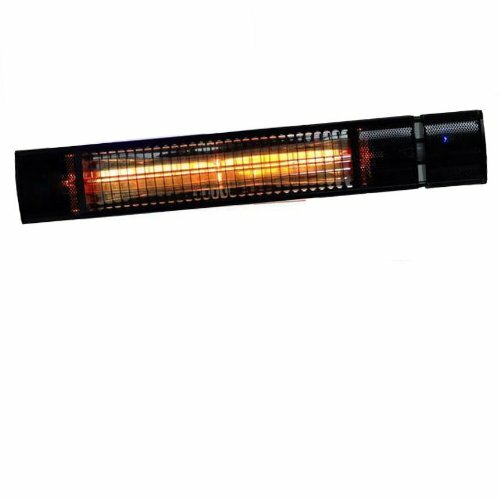 The heating area is slightly lower than we’d expect, but if you’ve got your heart set on a Chillchaser patio heater then we can’t fault this one. You’re also saving yourself a few pounds by buying from Amazon. However, if you’re looking for something that’s a bit more versatile and offers a larger heating area, with a longer element life, comes with remote control operation and uses a carbon fibre elements in the same price bracket then you may want to look at the Veito range of heaters.